Recent Croatian railway infrastructure modernisation has been financed via our own resources and partly from EU funds. In the future we will place a greater amount of focus on securing funds from EU resources. At HŽ Infrastruktura, we would like to highlight how proud we are of having secured €387 million of grant funds – with projects amounting to €73 million having already been completed, while the difference lies in projects which are currently being implemented. Furthermore, readers of Global Railway Review might find it interesting to note that five HŽ Infrastruktura projects amounting to €10.5 million are currently going through the public procurement process and 85% of the funds necessary for those projects are to be provided by EU funds. On 29 April 2016 HŽ Infrastruktura signed contracts for the upgrade of the Dugo Selo–Križevci railway section and construction of a second track. The project, which encompasses works performance and supervision, is worth one billion and 254 million HRK with 85% to be financed by EU funds, while the remaining 15% is financed by national funds. HŽ Infrastruktura signed contracts with a consortium made up of the Croatian companies DIV d.o.o., DALEKOVOD d.d. and ZAGREBMONTAŽA d.o.o., while the contract for works supervision was signed with a consortium including SGS Adriatica and Investinženjering. Works are to commence during the summer of 2016 with completion planned for the first half of 2020. There is potential to increase transit along key European transport corridors, particularly for international cargo moving north to the growing Central European markets. Therefore, we are modernising this and other sections of the Mediterranean corridor which includes the Croatian port of Rijeka. The Dugo Selo–Križevci project is part of a 38.2km-long line section and is one of the many priorities for Croatian railway modernisation which is part of a wider project to establish a high efficiency double-track railway line for mixed transport along the entire Mediterranean corridor. 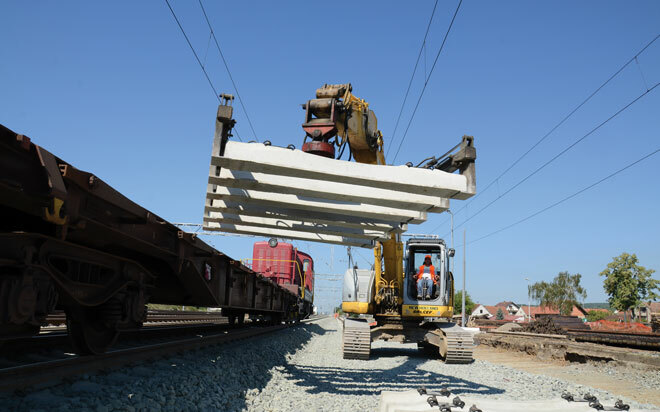 On completion of all planned projects on the Dugo Selo–Križevci sections, trains will operate at a maximum permitted speed of 160km/h, with a carrying capacity of 25 tonnes per axle. Furthermore, traffic safety will increase due to the elimination of level crossings and the construction of several overpasses, underpasses and subways, plus the construction of 25km of service roads. Line capacity will be significantly increased (by approximately 2.5 times) and journey times reduced by approximately 30%. In addition to the reconstruction of three rail stations, two stops will be renewed as well as the construction of a new station – with the aim to accommodate 750m-long interoperable freight trains and 400m-long passenger trains on the section, according to European standards. Furthermore, approximately 20km of noise protection barriers (also in line with European standards) will be constructed that will increase the quality of life for people living next to the tracks. One of our goals is also the modernisation of local and regional lines with the objective of creating the preconditions for the development of an integrated public transport system serving commuters in greater urban areas, such as the city of Zagreb. With this in mind, another important HŽ Infrastruktura project, which is also 85% co-financed by the EU, is the construction of the new 12km-long single-track line between Gradec and Sveti Ivan Žabno. The contracts for this project, worth HRK 203 million, were signed in the summer of 2015 and work commenced in December the same year. Completion is planned for the end of 2017 and work is being carried out by a consortium of the Spanish company, Comsa, and German company, Wiebe, while the works’ supervision contract was signed with the consortium of Croatian companies, SGS Adriatica and Investinženjering, plus the Swiss company SGS. Over the past eight months alone, EU co-financed project contracts have been signed to the value of approximately €200 million. There are also two new projects amounting to €145 million in the pipeline. The first is the electrification of the Zaprešić–Zabok line which counts towards the development and expansion of Zagreb City suburban rail transport. The second project is the electrification of the Vinkovci–Vukovar line which is of great significance for the ‘intermodal chain’ because it forms an indirect connection with the Port of Rijeka and the port of Vukovar on the Danube River, i.e. the Rhine-Dunav TEN-T corridor. As aforementioned, we are currently focusing on investments financed with the proceeds of EU funds (in total approximately €2 billion) which includes the reconstruction and construction of a second track on the Dugo Selo–Novska section; the construction of a second track on the Križevci–Koprivnica–State border section; and the construction of a new double-track line between Goljak and Skradnik. A study for installing the European Railway Traffic Management System (ERTMS) on railway infrastructure is ongoing, as well as the Zagreb Railway Node Development Study Zagreb. These studies will be completed by the end of 2016. Furthermore, under the CEF Programme – which is intended for investments in infrastructure – priorities of the European Union in the field of transport, energy and digital technology, three HŽ Infrastruktura projects have been selected, amounting to €36.5 million. Approximately 85% of the funds necessary for these projects will come from EU funds and the projects will include the reconstruction of the Rijeka-Brajdica station (which was jointly applied for by the Rijeka Port Authority and HŽ Infrastruktura), preparation for constructing a second track, plus upgrade and modernisation work on the Škrljevo–Rijeka–Jurdani section. Also, HŽ Infrastruktura have signed a €460,000 Grant Agreement for technical assistance to improve capacity building which is 100% funded from CEF. HŽ Infrastruktura d.o.o., as the manager of Croatian railway infrastructure, is in charge of the organisation and management of railway traffic operations as well as the safety of those operations. The entire safety system is continuously monitored and irregular events are analysed with a series of activities prescribed by HŽ Infrastruktura Safety Policy being implemented. Despite the fact that developments have been satisfactory, there is still room for improvement. Since safety also has its price, HŽ Infrastruktura is significantly investing in the modernisation of lines and devices and to increase safety at level crossings. In 2014 safety devices with light and audio signalling, as well as half-height barriers were installed on 23 level crossings, which represented a HRK 30 million investment into safety. In 2015, 19 level crossings were modernised with light and audio signalling safety devices and half-height barriers. Further investments for modernising level crossings are expected to continue over the next two years; currently, the necessary permits are being obtained to complete works totalling approximately HRK 42 million for securing another 33 level crossings. Plans are in place during 2016 and 2017 to modernise 50 level crossings. Funding worth HRK 60 million has been secured from a World Bank loan to complete the work. All of this contributes to safety and will definitely improve the quality of railway transport in Croatia. In delivering the planned infrastructure growth, we have to overcome all the challenges and mitigate the risks. The company is undergoing a restructuring process to adapt it to EU regulations, to improve the quality of railway services and to rationalise operations. In summary, we have a favourable geographical position for the development of international transport (as a part of the former Pan-European corridors X, Vb and Vc). We have technologies, staff and regulations that enable high levels of transport safety as related to other transport branches. We have expertise, experience in maintenance of railway infrastructure and rail traffic regulation to catch up with backlogs in investments and the owner’s decision to carry out modernisation and raise the quality of rail infrastructure. I think that we are on the best path to realising our goals and making the railways a more economical, profitable, energy-efficient and environmentally-acceptable transport system with a bright future. Renata Suša was appointed President of the Management Board of HŽ Infrastruktura in August 2014. She moved to that position from her former post as Vice-President for Investments of Nova EuropskaUlaganja d.o.o. Renata’s previous positions were Director of Investments, Valuation and Advisory Services (IVAS) in Colliers International d.o.o., Project Manager in Hypo Alpe-Adria-Bank d.d., and Business Analyst in Deloitte d.o.o. Renata has gained a lot of experience working on project development, value appraisal of real estate, analysis and active search for new investment opportunities, analysis and preparations of business plans, elaboration of marketability studies, investment feasibility studies, best-use studies for major investments, consultations in the phase of drawing up physical planning documentation, and consultations on public-private partnership projects, etc. Renata graduated from The Faculty of Economics and Business at the University of Zagreb in 2004, specialising in finances.